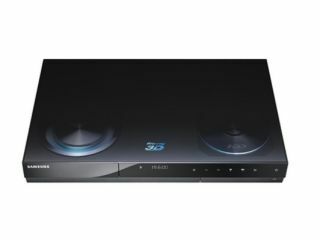 Samsung has shown off the BD-C8900 3D Blu-ray player with a built in HDD, stating that its latest player offers 'unlimited entertainment'. The Samsung BD-C8900 probably won't offer unlimited entertainment in all honesty, but it does offer a Full HD 1080p picture, DVB-T/C or DVB-S2 tuners, and 120 hours of recording space for your HD programmes. Interestingly, the kit will also allow you to record and playback 3D content, which certainly makes it a desirable piece of kit for the early adopter. "Serving as a hub for home entertainment, the BD-C8900 enables consumers to consolidate all digital media files in a single device with its 500GB/250GB hard disk drive," says Samsung's release. "It also allows for easier content sharing with other devices using wireless AllShare or USB 2.0 connectivity, and includes a wireless LAN adaptor with access to Samsung Apps." The Samsung BD-C8900 is available now and is priced at around £580.